NEW! Gain balance and coordination and reduce the risk of injury while gaining strength. Target the core muscles of the body’s trunk with strength exercises combined with medicine balls, stability balls, gravity and your body weight. All levels of fitness experience welcome. Special FREE demo this Thursday, February 28, 8:20am – 8:50am at Wylie Recreation Center. Arrive 15 minutes ahead of time to check in at the front desk. Space is limited. Try out the class, but don’t stop there! 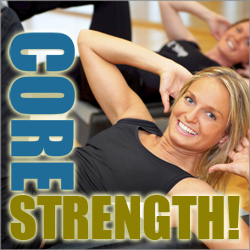 Regular Core Strength sessions start March 7. Register now.